Spirit Fitness has done it again with the Spirit XT800 treadmill. It’s sleek and stylish without sacrificing quality. 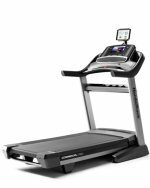 Just as with other models from this treadmill line, the Spirit XT800 treadmill includes a lot of horsepower for the advanced athlete to the beginner. This creates a large ability to grow into the machine, while other machines with undersized motors limit you in terms of how fast and how far you can go. The versatility of the treadmill exercise programs allows you to turn over your workouts to the machine, while one manual program is also available. Fun extras like a cup holder, cooling fan, and built in speakers add to the function of the Spirit XT800. 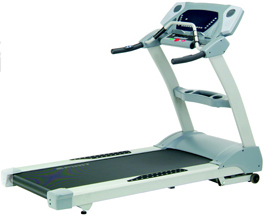 UPDATE: The Spirit XT800 treadmill has been discontinued and is no longer available for sale. You can compare the latest models here to decide which one is right for you. Most reviewers need to look for high quality points to point out, but with Spirit treadmills, experts need to really look for flaws in the machines – not that they are easy to find. The main feature that really entices testers is the three inch health club style rollers, giving the runner or walker a sturdy and steady surface with each step. The Spirit XT800 treadmill is made for light commercial use, so it’s no wonder that the construction is so solid and ready for any level of use. Users find the Spirit XT800’s wireless heart rate monitor and heart rate bar easy to use and easy to access during even the toughest treadmill workouts. This feature allows you to decide between the wireless monitoring and the hand grips – whatever’s more comfortable. The warranties on Spirit treadmills continue to impress reviewers, with a lifetime frame and motor guarantee and five years for parts and labor on the XT800 – not that they think you will need it. Needless to say, we are as impressed with the Spirit XT800 treadmill as we are with other Spirit treadmills, though it is the added versatility of the heart rate monitoring that really has us sold. The $2399 price tag might limit its purchase by the beginning exerciser, but if you start saving up now, you can invest in quality that does not disappoint.